School districts continually struggle to meet individual student needs. The charge before school administrators is to determine both the function of the behavior and the intervention that will improve the chances positive behavior will increase and negative behaviors will decrease. Failure to successfully meet this charge often results in ineffective and unnecessarily restrictive procedures and legal Challenges. Equally challenging for administrators and teachers is finding a way that is both efficient and effective to address the unique behavioral needs of students. A “one size fits all” approach rarely works, especially when the function of the behavior varies with each student. How do we ensure our staff has the tools to enable them to determine the functions of a student’s behavior and to develop a specific intervention plan for the student and staff to be successful? How do we engage behaviorally at-risk students who are academically behind or on the brink of dropping out? What is the most effective way to empower staff with the tools to do the job, without overwhelming them with lengthy and technical procedures and forms? Providing Personalized Paths for success through Insights to Behavior Because of the personalized path it offers, Insights to Behavior is an efficient and effective way for schools to address the diverse behavioral needs of struggling students. Students, parents, and staff have a great desire to see the student successful. Unfortunately, when students struggle and neither the student or the adults know how to address the behavior, there are no winners. In this series of articles, we’ll explore five practical concepts school leaders can utilize to address behavior and empower stakeholders to successfully create a plan to move forward, monitor interventions, and increase student success. How can we ensure we are meeting all legal requirements, state expectations and have bullet-proof documentation? 5 Practical Concepts to a Implement a modernized, systematic and effective Behavior Management System. School Psychologists complete full FBA on every student with any type of behavior issue. Student Support Teams have capacity to provide ideas and resources for teachers, parents and students. Student Support Teams have time to track interventions and their success rate. As interventions need adjustments, student support teams collaborate to customize next interventions. Data is readily available for all stakeholders. Many schools do not have school psychologists on staff. School Psychologists cannot meet demands. Staff do not possess the expertise to conduct the Functional Behavior Assessment or the intervention plan. Intervention plans are unrealistic for teachers to carry out. Teachers do not understand why the student is misbehaving or the need to tailor the intervention to the reason. Teachers do not have time to sit through SST meetings. Ideal Charge & Challenge: Administrators across the nation are charged with the legal responsibility to maintain a safe, violence free environment, while implementing the Highest Quality of Educational Delivery for each individual student. The charge is non-negotiable, regardless of the needs of the student – be they regular ed, special ed, fall under a 504 plan or are considered at-risk of potential failures. We know the Charge, and that is where the Challenge comes into play. The challenges take shape in many forms – time, money, expertise, professional development, federal mandates, legal pressures and teacher performance issues. Will our teachers use this tool? Is this tool easy to use and understand? Does the tool define the behavior & determine function? Does the tool assist with the creation of realistic plans and make monitoring data more efficient? Will the tool impact student outcomes? As we continue this article series, we will discuss these topics in detail and offer actionable and research-based strategies and best-practices for how to modernize Behavior management in your k-12 district. Insights to Behavior is a web-based solution to produce Individual Behavior Plans in one-hour or less. Benefit from dashboard reporting, video-based CE training on-demand, a novice-friendly functional behavioral assessment tool, and a library of research-based strategies. 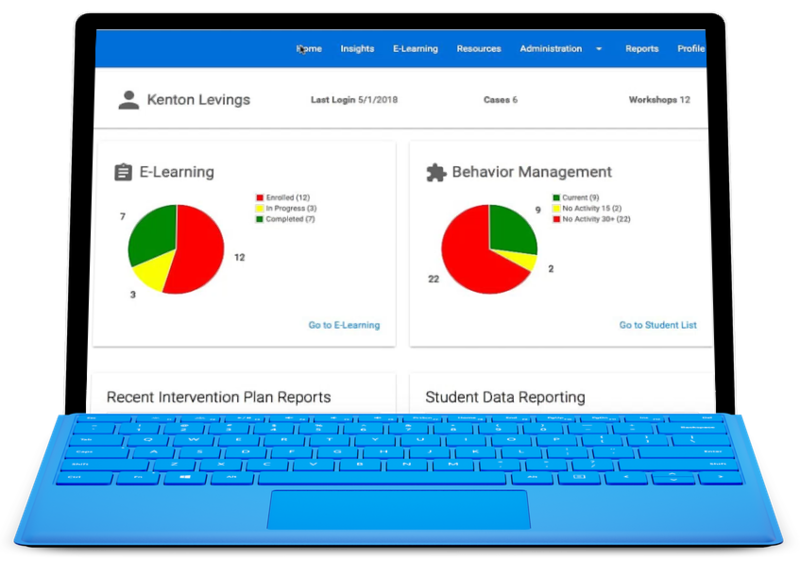 Insights to Behavior empowers administrators and teachers with the tools they need to speed up workflow, foster safer schools, and create more peaceful and productive classrooms.